This is a highly customizable and very easy to use IAB Pushdown template. A user opens the webpage and sees the collapsed banner in the placement. On click, the banner expands and pushes web page’s content down. Once expanded, the banner can offer additional video or other rich media experience. The expanded banner accommodates a link to the predefined landing page. The ad maintains this size until mouse off or “Close” button click. The ad expands as many times as the user clicks on the initial stage banner. Video player needs a MP4/WEBM/OGV format videos (it is recommended to have more than one video file type). A poster for the video, if there will be a video wall (the wall will be black before playing the video if no poster will be provided). In case the browser is very old and doesn't support HTML5, the backup image (PNG/JPEG) is required (set in additional assets). The file “index.html” can be adjusted to customize the banner components. INFO: Please refer to the Video Player component for more detailed information on component setup and behavior. Click on the call to action button to expand, click on “Close” button to collapse. “Close” button required on expanded banner. Landing page opens in a new window. Available on user initiation only (click). Off by default. Audio mute button or volume control required. Max. video duration: 30 sec. Stop/Pause and Play button controls required. Select “Template” which will take you to Adform HTML Studio. 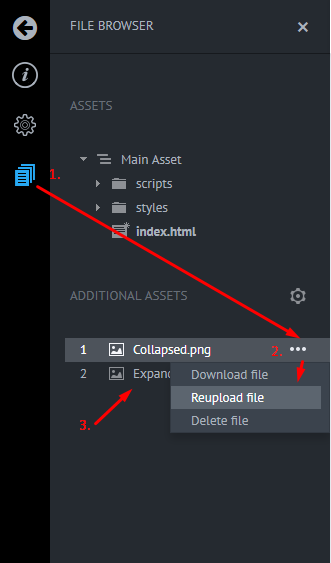 Head into the file browser (1) and re-upload collapsed image (2) and expanded image (3) with assets from your device. Save banner settings (4) and Export banner to HTML Studio .zip file, or Import directly to a campaign in Adform. In the Initial Settings step, name your banner, select Category as “IAB Branding” and Format as “IAB Pushdown (Single file)”. Select a Banner Batch from the drop-down menu. In the next step, you are asked to select or upload assets. If you have previously uploaded the assets to the system, click the Select button and choose Banner source, i.e. select HTML File named HTML_IAB Pushdown_(single_file). Make sure that the clickTAG is present. Video poster goes below video files. For more details about format production: please contact our local office.